For this untitled performance, Stefanie Marshall transformed the Zsa Zsa storefront gallery into an alchemist’s workshop. 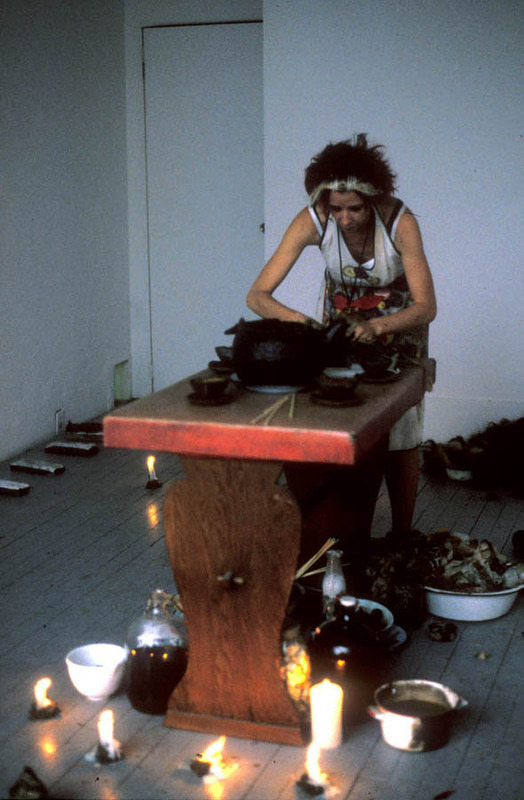 Using earthy, pungent materials including clay, molasses, urine, human hair and rags, Marshall toiled away over a smoking cauldron, fashioning misshapen dolls and totems to place on clay beds around a table set with teacups. Themes of transformation and illusion are played out in Marshall’s work through ritualized actions and gestures with bizarre, obsessive and occult overtones. Stefanie Marshall is a Toronto artist working in two and three-dimensional mediums, performance and installation. Throughout the ’90s Stefanie performed and exhibited her work regularly both locally and internationally. She was an invited artist at the Cleveland Performance Art Festival in 1996 and 1997 and was recently included in the prestigious New Contemporaries ’99 show in London, England. Stefanie Marshall uses personal ritual with an emphasis on sensual elements to reveal the vastness of our interior emotional and psychological terrain. In her work she reanimates the cast-offs of our personal histories — old clothes; sticky, greasy, smelly foods; abandoned architecture; forgotten rhymes — and in so doing resurrects the lingering sorrow and sublime that inhabit them.